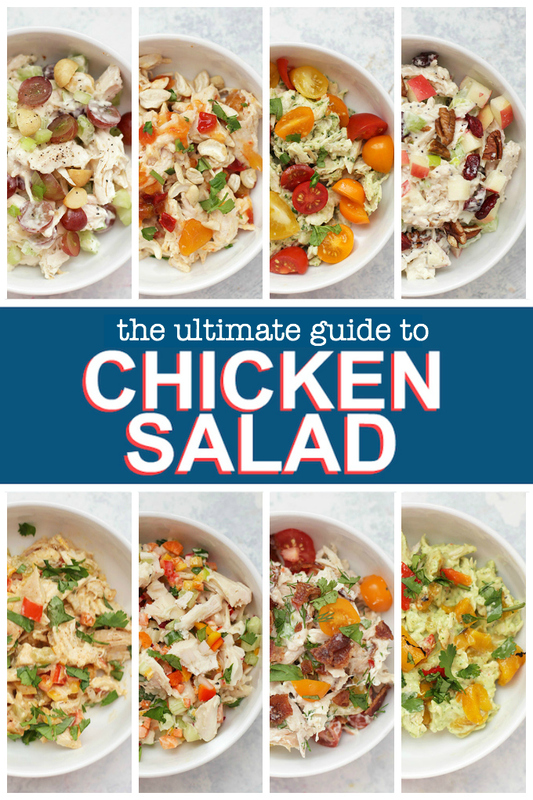 The Ultimate Guide to Chicken Salad – Everything you need to know to make a flavorful, colorful, DELICIOUS chicken salad + 8 amazing varieties I know you’ll love as much as I do! 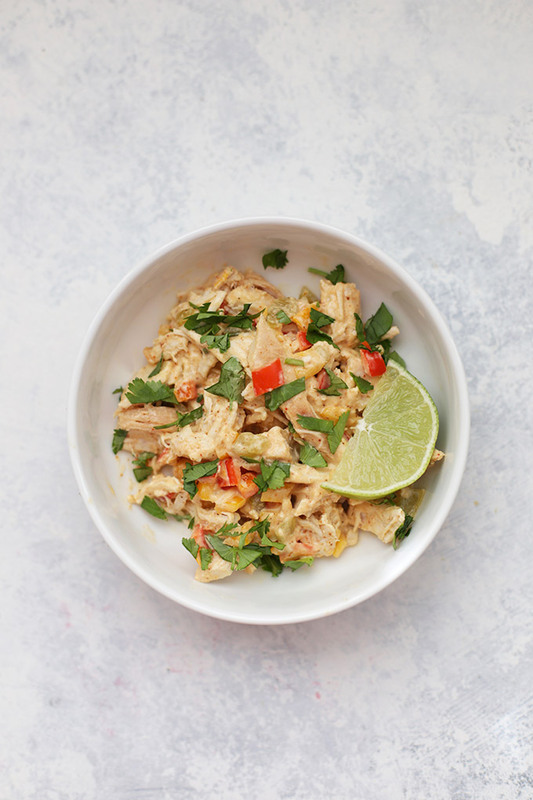 Chicken salad is one of those easy “recipes” (it’s really more of a method) that I sometimes forget about, but it’s really one of the best dinnertime solutions when time is tight, or you don’t really feel like cooking. For me, that’s about 6 months of “summer” a year here in Arizona. 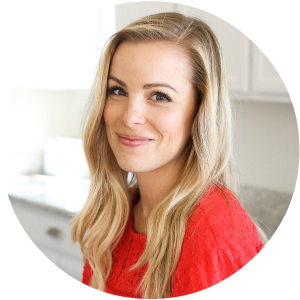 With another Eternal Summer on its way (it was almost 90 degrees in February last year, and we’ve hit the mid 80’s a few times this week), I’ve started working on developing recipes that will hold my interest and taste amazing all year long. 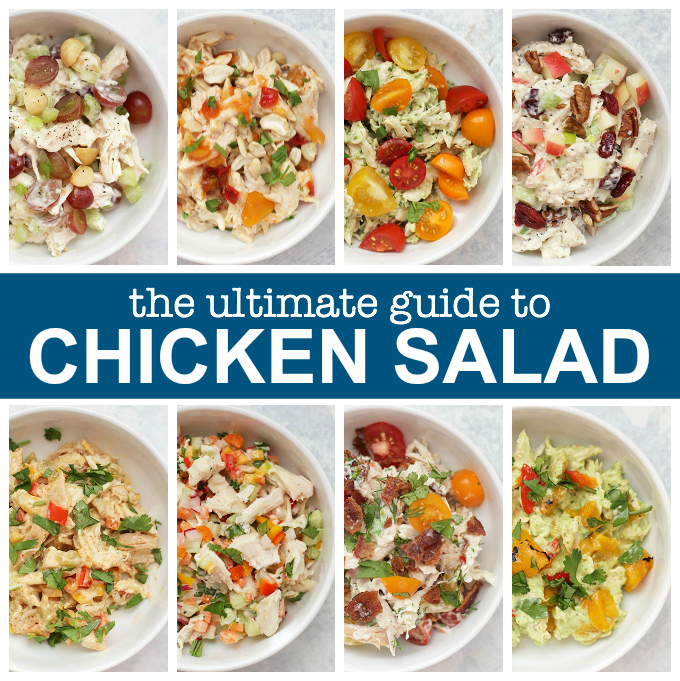 So consider this my Ultimate Guide to Chicken Salad. 8 flavorful, delicious, EASY recipes that will keep your interest (and inspire your creativity) all year long. It’s all about combinations. 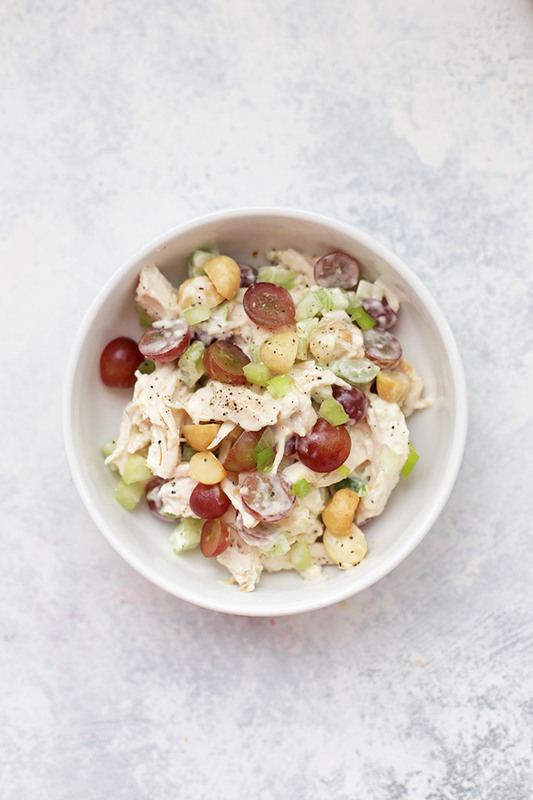 Everyone has their own favorites with chicken salad. I’m always looking to combine a few different textures and flavors–maybe something crunchy (like celery or apples) with something sweet (like grapes or dried cranberries), or something spicy with something crispy, like toasted nuts. It’s always fun to throw in something unexpected or bright, like fresh herbs, dried spices, or even something like mango chutney or green chiles. Play around! But I don’t like mayo! I’m usually not a big mayonnaise person, but I’ve been really happy with homemade mayo or this veganaise (I buy it at Sprouts, Target, Walmart, and even Costco sometimes). Some versions below work with avocado, or you can try going halfsies with mayonnaise/veganaise and Greek yogurt or another flavor enhancer, like salsa, chutney, etc. Be flexible. The amounts here are totally variable based on your own preferences. I’ve given suggested amounts as a starting point, but trust your taste buds. If you like yours a bit more creamy, maybe add a touch more mayo. Want more spice? Feel free to add more! Think beyond the bread. 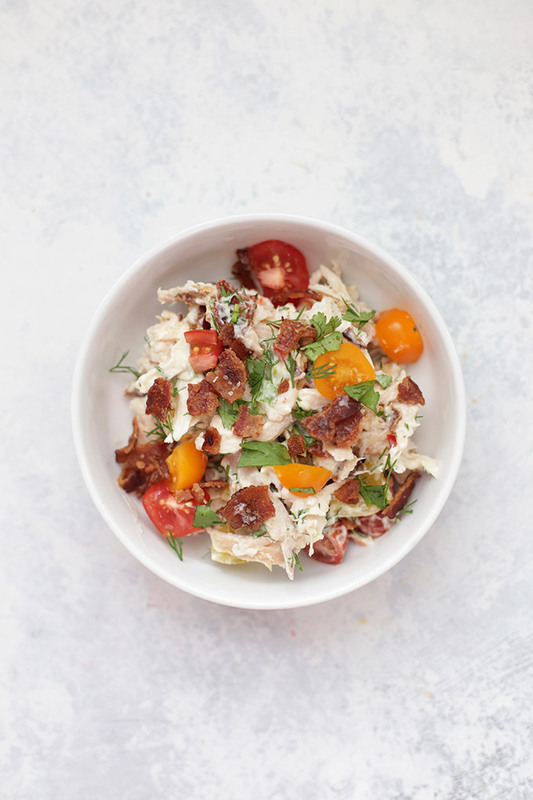 Croissants and bread are amazing, but think beyond the bread when it comes to serving chicken salad. Try apple or cucumber slices, crackers, tortilla chips, avocado halves, bell peppers, and more! It doesn’t get much more classic than this. Crisp celery, sweet grapes, and a little crunch from the nuts…this one is a perfect home base recipe that’s good on anything from a croissant to a lettuce wrap. Pro tip: macadamia nuts are my favorite for this. Combine all ingredients in a medium bowl. Taste and adjust based on your preferences, adding more salt, pepper, or lemon juice as desired. Feel free to use salted or unsalted nuts for this recipe! Such a flavorful twist on the classic. Mango chutney adds sweetness, tanginess, and color, and the subtle hint of curry? I love this one served in lettuce wrap form (butter lettuce is my fave). Amazing. Pro tips: Don’t skip the cilantro and try it with salted cashews! In a medium bowl. combine all ingredients. Taste and add additional chutney, lime juice, salt, pepper, or curry powder to taste. 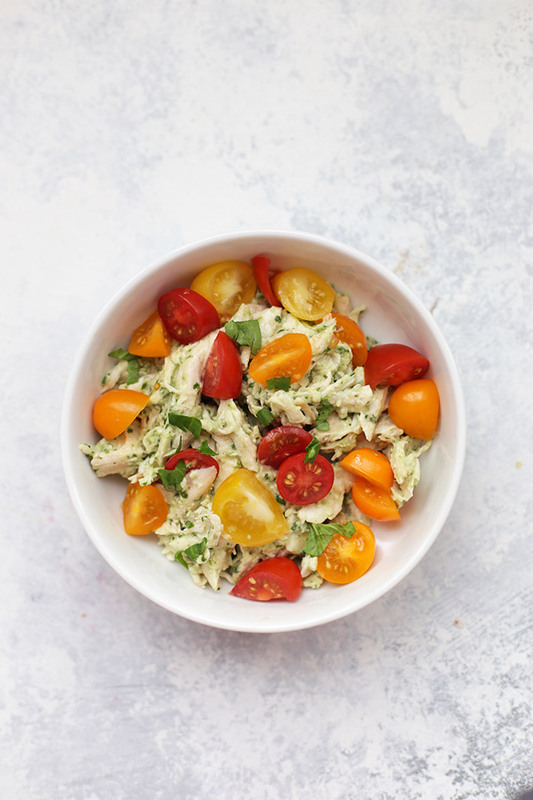 I love pesto in or on almost anything, but on chicken salad it’s extra amazing. So much freshness and flavor going on with just a few spoonfuls! Pro tip: try adding a few diced sun-dried tomatoes or kalamata olives to change things up! Combine all ingredients in a medium-sized bowl. Taste and add additional salt, pepper, pesto, etc. to taste. I love creamy poppyseed dressing on spinach salads with cranberries and diced apples. 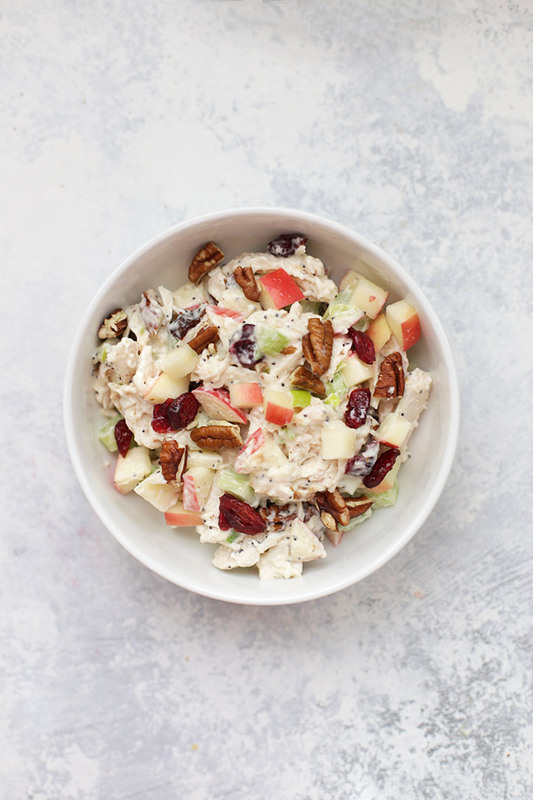 This carries a lot of those same flavors, but with a little crunch from the pecans and celery. An easy favorite! Pro tip: try serving this on apple slices for extra crunch! Combine all ingredients in a medium-sized bowl. Taste and add additional lemon juice, salt, pepper, or mix-ins to taste. 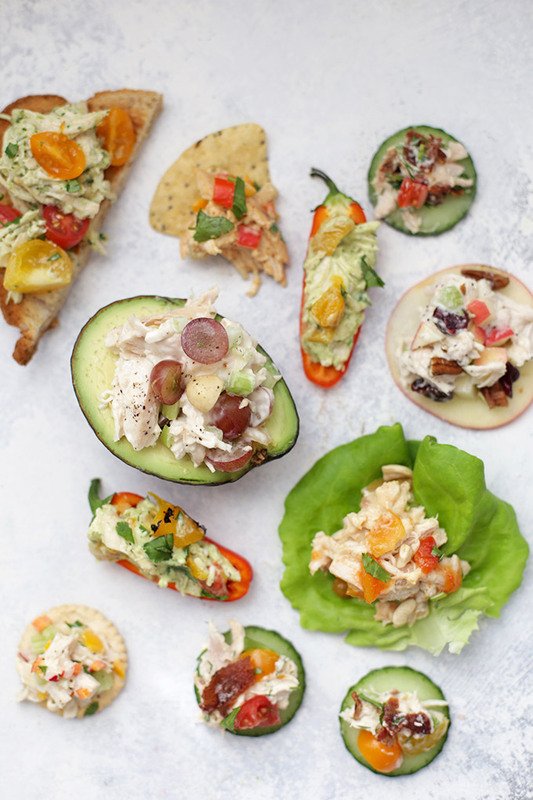 Taco salad meets chicken salad in this zippy twist. Green chiles tend to be very mild, so feel free to add more if you like things on the spicy side. Try adding some black beans to fill it out even more! Pro tip: this is a-m-a-z-i-n-g scooped up with tortilla chips. Combine all ingredients in a medium-sized bowl. Taste and add additional cilantro, lime juice, spices, salt, or pepper to taste. 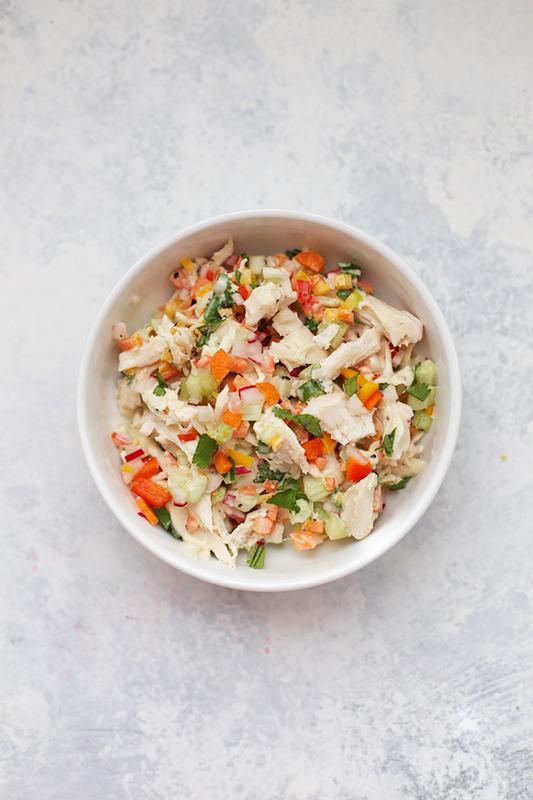 Load that chicken salad up with lots of crispy, flavorful veggies! They add so much beautiful color and flavor and keep this dish anything but boring. Don’t skip the fresh herbs! I love this one with crackers, but it’s awesome any way you can think to serve it. Pro tip: the more finely you mince the veggies, the better this turns out. Combine all ingredients in a medium-sized bowl. Taste and add additional herbs, lemon juice, salt, pepper, etc. to taste. There are few things I love like the combination of chicken, bacon, and ranch. It’s the perfect savory, smoky combination. This has a ranch feel without any actual ranch dressing, but you can substitute ranch dressing for the mayonnaise, lemon juice, herbs, and spices if you like. Good luck not eating the entire batch in one sitting! Pro tip: I’ve tried this with my avocado ranch instead of the mayo, garlic, and onion powder, and it nearly brought me to tears it was so good. Don’t say I didn’t warn you. Combine all ingredients in a medium-sized bowl. Taste and add additional herbs, lemon/lime juice, spices, etc. to taste. 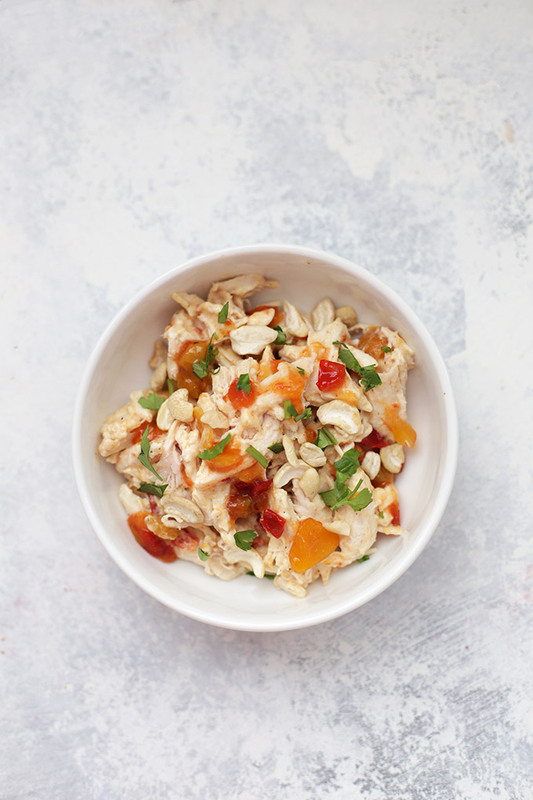 Chicken salad without the mayo! Avocados are my love language and I hardly need any excuse to add it to a recipe. 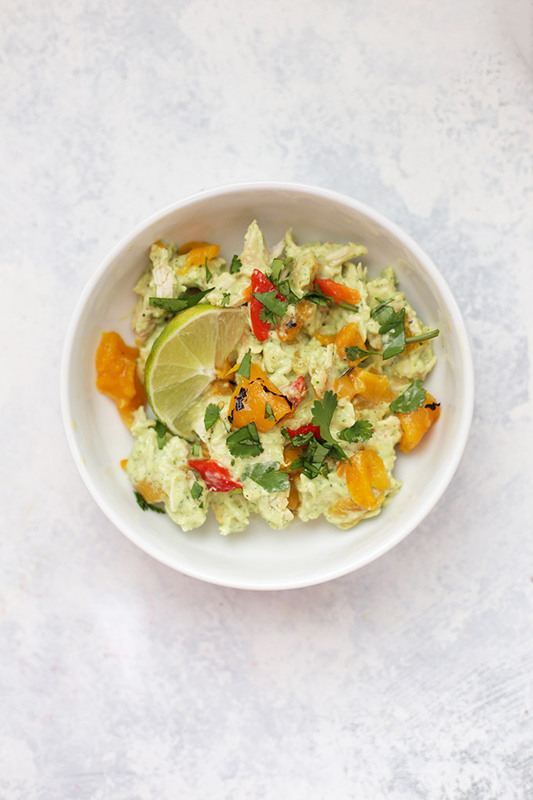 The result here is kind of like guacamole crossed with chicken salad. It’s as amazing as it sounds. The roasted bell peppers and fresh cilantro MAKE THIS. Pro tip: try serving this on mini bell pepper halves or with bell pepper strips as dippers. Ahhhhmazing. Mash avocado with lime juice in a medium-sized bowl. Stir in all other ingredients and stir to coat. Add additional lime juice, avocado, salt, pepper, etc., to taste. What are you favorite flavors? Any favorite ways to serve it? Avo and lime! I AM THERE! Love these crisp, fresh salads. I can’t wait for summer to hit the UK so I can get started on salad season!